Following 9/11, Americans’ fears of terrorists-especially domestically based Islamic extremists-reached near-hysteria levels. The government and media reports stoked fears that malign actors living in the US had not only the desire but the means to wreak extreme havoc and destruction. Early reports estimated slightly more than 300 al Qaeda operatives living in the United States, and it wasn’t long before this number became 2,000 or 5,000 domestic terrorists. As these estimates snowballed, so did spending on federal counterterrorism organizations and measures, and it now totals over one trillion dollars. The federal government launched more covert operations in the name of fighting terrorist adversaries than they did in the entirety of the forty-five year Cold War. For each apprehension of a credible terrorist suspect, the US government created or re-organized two counterterrorism organizations. The scale of these efforts has been enormous, yet somehow Americans remain fearful of what they perceive to be a massive terrorist threat. But how well-founded is this fear? Is the threat of terrorism in the United States as vast as it seems and are counterterrorism efforts effective and appropriately-scaled? In Chasing Ghosts,two of our leading critics of the mushrooming national security state show that it has not, statistically speaking, been efficient or successful-to say the least. Only one alarm in 10,000 has proven to be a legitimate threat-the rest are what John Mueller and Mark Stewart refer to as “ghosts.” These ghosts are enormous drains on resources and contribute to a countrywide paranoia that has resulted in widespread support for (and minimal critical questioning of) massive expenditures and infringements on civil liberties, including regular invasions of privacy and legally questionable imprisonments. 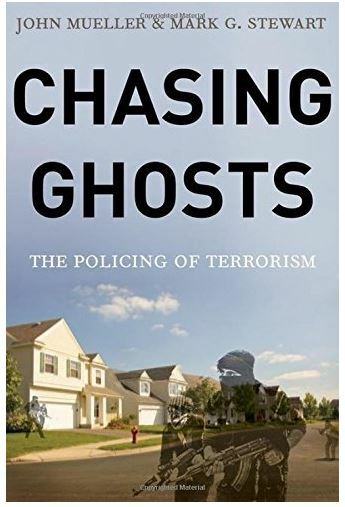 Mueller and Stewart contend that the “ghost chase” occupying that occupies American law enforcement and fuels federal spending persists because the public has been lead to believe that the terrorism threat is significant. As they show, it is not a significant threat-certainly not large enough to justify the vast security state apparatus that has emerged to combat it. The chance that an American will be killed by a terrorist domestically in any given year is about one in four million (under present conditions). Yet despite this statistically low risk and the extraordinary amount of resources put towards combating threats, Americans still worry and the government still spends billions. Until the true threat of domestic terrorism is understood, the country cannot begin to confront whether our pursuit of ghosts is worth the cost.